Offering you a complete choice of products which include industrial ozonator. As a prestigious name in this sector, we are persistently indulged in designing and fabricating the best in class water Industrial Ozonator for our honored clients. 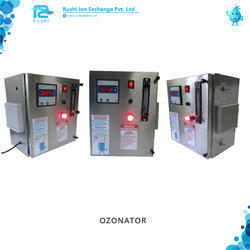 This ozonator is suitable for producing a glass of fresh ozone water for drinking. It is widely used to increase the oxygen content of the water as well as to give fresh taste. Our provided system is widely demanded in the pharmaceutical, water processing, food processing and other industries. In addition, this water Ozonator is known for its easy operation and simple maintenance.